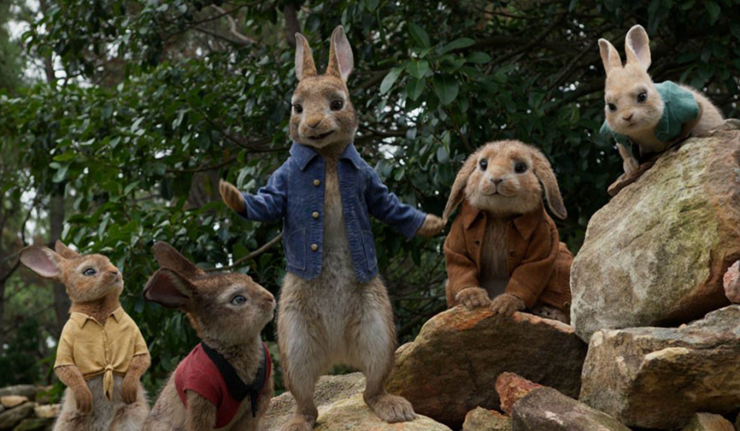 February 15th, 2018 – The new “Peter Rabbit” movie has a lot of parents hopping mad. If you didn’t think that joke was funny, you have something in common with a group of parents who didn’t find a scene in which the rebel rabbit throws blackberries at Mr. McGregor all that funny either. What may seem like a typical cartoon cat-and-mouse prank takes a different tone when the audience finds out that Mr. McGregor (Peter’s archenemy in the battle for the vegetable garden) is actually allergic to blackberries. After being pelted with the berries, the gardener begins to choke, collapses, and then has to inject himself with an EpiPen, all while Peter and his buddies laugh and cheer. This scene may seem like it fits in perfectly well with the world that Beatrix Potter created in 1902. The author laid out a long rivalry between the bunny family and the gardener, but some say she would be disappointed in the way this version of her tale treats people with food allergies. Many other parents not only had an issue with allergies being mocked but worried that the scene would be used as a bullying tactic. Dr. Purvi Parikh, an allergist and immunologist, spoke to CNN about her experience with cases where school bullies use food allergies as a means to threaten or harm fellow classmates. With these public statements and a hashtag movement of #boycottpeterrabbit on Twitter, Sony Pictures (which released the movie last week) quickly made a public apology. “Food allergies are a serious issue. Our film should not have made light of Peter Rabbit’s arch nemesis, Mr. McGregor, being allergic to blackberries, even in a cartoonish, slapstick way. We sincerely regret not being more aware and sensitive to this issue, and we truly apologize,” the statement said. The reactions online continued to be mixed with people pointing out the bigger problems in the world while some maintained how personal and real this issue remains. Stop it with all the “boycott Peter Rabbit” talk. It’s a CARTOON with fake rabbits trying to poison a fake character so that they can eat out of his fake garden. No one is making a joke about food allergies. Go see it. It’s a cute movie.